The Thrustmaster VG TM 28 GT Leather Rim Add on was released in April of 2015 as the first rim wrapped in leather for the Thrustmaster eco-system. 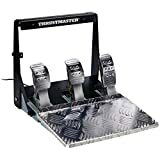 Similar to other Thrustmaster rims, it connects your wheel base via Thrustmaster’s quick release system and is easily swapped on and off your T500, T300, or TX. This rim is 11 inches in diameter, very lite weight, and smells like premium leather the moment you unbox it!! The steel internal wheel rim is wrapped in a nice feeling genuine leather and it really lets your palms breathe when you are gripping it. 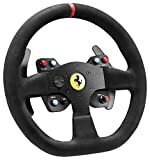 The rim is similar in design to the 599XX Evo rim with a similar button layout, metal center column, and steel rim hoop, but is 1 inch shorter in diameter, less expensive and wrapped in premium leather as opposed to Alcantara. 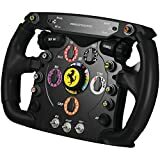 I like this wheel rim for the price and the way it delivers force feedback effects, I’m just not particular about the way it looks with the colored buttons and Thrustmaster logo in the center. 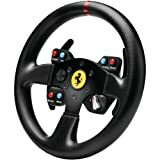 11 inches in diameter, premium hand stitched leather wrapped rim, two 5 inch brushed metal paddle shifters, 6 action buttons and a d-pad, 3 position rotary switch, black brushed metal center column, Thrustmaster’s quick release system, internal steel hoop, designed with automotive standards. The rim is super lite weight and has a steel internal hoop and you can really get a feel for it with force feedback. The steel hoop is pretty well padded and gives a nice cushiony feel in your hands. I’m not particularly a fan of the 11 inch diameter, I prefer a 12 inch rim, but this size is standard. While the buttons are laid out for easy access, they are not ideal for Playstation. The white button (on the bottom left of the wheel center column) is designated as “X”, which is in most PS games is a “selection” button. Because it’s on the left side you have to either move your left thumb from the D-pad or slide your right hand over to press it. Not the end of the world, but worth mentioning here. 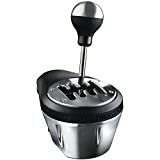 The paddle shifter are made of a nice 2mm thick brushed metal and give a good “click” sound when engaged. I have logged about 100 hours on the 28 GT Leather Rim and it has held up really well. I was initially concerned that the leather was going to show signs of fatigue, but so far it looks like new. If you have a stock rim on your T300 or TX wheel base, this rim is a HUGE upgrade performance and overall feel. If you are looking for a leather rim, this add on is a home run. It looks and feels in your hands every bit the part of a high performance racing wheel. The leather is the most standout feature of this rim. It smells like quality from the moment you open it up. Even better it feels like quality in your hands when you are holding on for dear life sliding through a turn! As I stated Im not such a huge fan of the button color choices, but I do like the yellow centering strip they used. 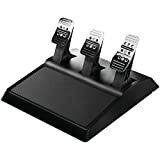 “This rim is a solid choice for an upgrade and really performs well delivering force feedback”The Thrustmaster 28 GT Rim add on has gotten great reviews at Amazon, 4.5 stars with over 40 customer reviews. I have to agree with the customers on this one, this is a 4.5 star wheel for sure and provides every bit of your money’s worth! 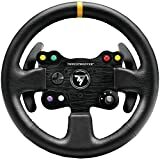 Have your tried the Thrustmaster VG TM 28 GT Leather Racing rim add-on or other Thrustmaster rim add-on’s? Let me know in the comments.